Kalinga Institute of Industrial Technology (KIIT), Bhubaneshwar, Odisha has scheduled the Kalinga Institute of Industrial Technological Entrance Examination (KIITEE) examination from 15th to 24th April 2018. 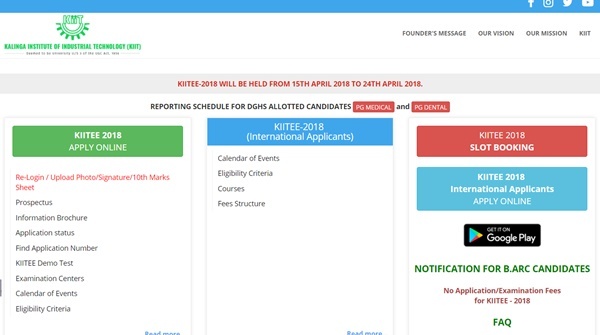 All the applicants enrolled for KIITEE admission test can download KIITEE Hall ticket 2018 from 1st to 5th April from the KIIT official website, kiit.ac.in. All the applicants can download KIITEE Admit Cards to attend the examination. Hall ticket verification will be held strictly at the examination center. Hence candidates must carry admit cards without fail. Otherwise, they will miss the opportunity to attempt the examination. KIITEE Admit Card 2018 : Kalinga Institute of Industrial Technology (KIIT), Bhubaneshwar annually conducts the KIITEE entrance test to offer admission into various undergraduate courses. Annually huge number of students seeking admission into KIIT applies for the entrance examination. Candidates seeking B.Tech and other courses. Candidates seeking admission have to get good merit in the test to get admission in KIIT. Candidates clearing the KIITEE examination will get admission into Graduate Degree in various streams such as Computers, Electronics, IT, Electrical, and other branches. Applicants will have to appear for KIITEE 2018 in the month of April from 15th to 24th. Candidates applied for the KIITEE 2018 can download the KIITEE call letter 2018 to appear for the test. Candidates can check the details date and time of the examination. The KIITEE examination will be held in various slots. Students can select their preferable slot to appear for the test. While applying. The KIIT is going to conduct the online examination in the selected slot. To appear for the test, candidates need to carry the admit cards. Check the KIITEE Hall ticket downloading process from here below.